On a rainy night in May, a sizeable crowd braved the elements for the penultimate night of the curiously named The Twilight Sad’s lengthy tour. Opening the night was a solo set from Jamie Clarke of The Ambience Affair, who played selections from previous album Burials plus new songs from an as yet untitled forthcoming album, due in November according to Clarke. Switching between acoustic and electric, he created a heady brew on songs like Plans, Devil In The Detail and a cover of Grizzly Bear’s Deep Blue Sea. Although his high-pitched vocals are something of an acquired taste, the set was well-received, setting things up for the main event. The Twilight Sad powered through much of their recent album Nobody Wants To Be Here And Nobody Wants To Leave, an album which for some lacked the defined identity of previous albums. However in a live setting singer James Graham’s voice soared over the dark, glorious sounds of There’s A Girl In The Corner and Last January. Older songs like That Summer I Had Become The Invisible Boy and I Became A Prostitute got a great response, and the band excelled on the gloriously noisy mess of Seven Years of Letters, and the muscular, malevolent stomp of In Shadows. James Graham’s faux ‘intense’ stage moves would be annoying but for his superb singing which rose above the swirling squalls of guitar. Older tracks like Nil and The Wrong Car maintained the excitement levels in the audience, and it was clear the band appreciated this, thanking the crowd in a way that felt genuine. Finishing with And She Would Darken The Memory, they departed leaving many wanting more, but this band has never done encores. 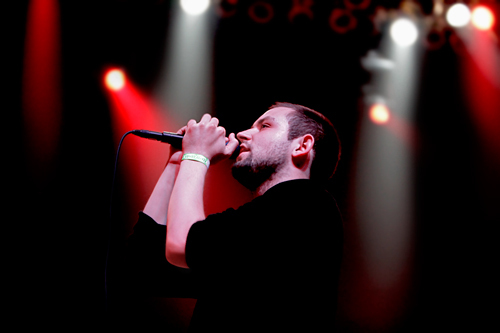 A most worthwhile proposition live, The Twilight Sad have plenty of ammunition to convert new fans.